We offer indigenous designed and developed high grade boiler gaskets. These are fabricated using high grade raw material such as grade channel and plates. These are in good demand in the market due to its durability and high quality at affordable prices. We offer indigenous designed and developed high grade boiler gaskets. These are fabricated using high grade raw material such as grade channel and plates. These are in good demand in the market due to its durability and high quality at affordable prices. Standard Pipe Flange : We stock all popular sizes and materials for immediate shipping. Custom Gaskets : We handle any size or shape. We fabricate these gaskets the same day, or within the hour if needed. We are offering Boilers Hose Pipe & Gasket Packing to our customers that are appreciated for their long working life. We are one of the most sought after authorized distributors of Boiler Asbestos Gaskets and our range is really popular among our clients due to its inbound quality. 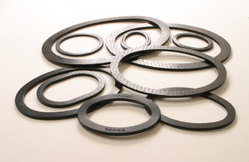 These gaskets are double-checked before being delivered and are available at extremely affordable prices. We offer indigenous designed and developed high grade Boiler Gasket. These are fabricated using high grade raw material such as grade channel and plates. These are in good demand in the market due to its durability and high quality at affordable prices. We have been counted amongst the most trusted names in this domain, engaged in offering standard quality range of Boiler Gasket. We will be manufacturing Double jacketed gaskets in our own indigenous manufacturing plant at Vadodara, Gujarat .The plant will operate at 100% capacity by April 2012. Matching with the changing and growing needs of customers, we are engaged in offering a large range of Boiler Gaskets. The products we offer to the customers are used in steam pressure vessels and many more uses. Our offered products are highly recommended amongst the customers for their availability in accurate dimensions. anufacturer a wide range of gaskets like boiler gaskets as per your drawing.